SUMMARY: Past explanations for how comets began have serious problems. After a review of some facts concerning comets, a new explanation for comet origins will be proposed and tested. It appears that the fountains of the great deep and the sustained power of an “ocean” of high-pressure, supercritical water jetting into the vacuum of space launched, as the flood began, the material that became comets. Other known forces would have assembled the expelled rocks and muddy droplets into larger bodies resembling comets in size, number, density, composition, spin, texture, strength, chemistry (organic and inorganic), and orbital characteristics. After a comparison of theories with evidence, problems with the earlier explanations will become obvious. 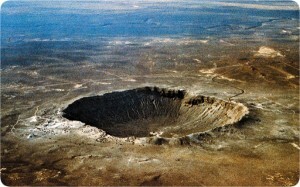 Figure 150: Arizona’s Meteor Crater. Comets are not meteors. Comets are like giant, dirty, exceedingly fluffy “snowballs.” Meteors are rock fragments, usually dust particles, falling through the atmosphere. “Falling stars” streaking through the sky at night are usually dust particles thrown off by comets years ago. In fact, every day we walk on comet dust. House-size meteors have formed huge craters on Earth, the Moon, and elsewhere. Meteors that strike the ground are renamed “meteorites,” so the above crater, 3/4 mile wide, should be called a “meteorite” crater. On the morning of 14 December 1807, a huge fireball flashed across the southwestern Connecticut sky. Two Yale professors quickly recovered 330 pounds of meteorites, one weighing 200 pounds. When President Thomas Jefferson heard their report, he allegedly said, “It is easier to believe that two Yankee professors would lie than that stones would fall from heaven.” Jefferson was mistaken, but his intuition was no worse than ours would have been in his time. Today, many would say, “The Moon’s craters show that it must be billions of years old” and “What goes up must come down.” Are these simply mistakes common in our time? As you read this chapter, test such intuitive ideas and alternate explanations against evidence and physical laws. Consider the explosive and sustained power of the fountains of the great deep. 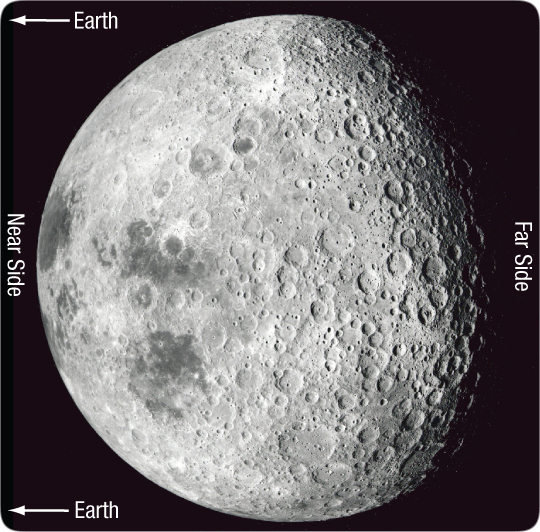 You may also see why the Moon is peppered with craters, as if someone had fired large buckshot at it. Question: Are comets “out of this world”? Comets orbit the Sun. When closest to the Sun, some comets travel more than 350 miles per second. Others, at their farthest point from the Sun, spend years traveling less than 15 miles per hour. A few comets travel so fast they will escape the solar system. Even fast comets, because of their great distance from Earth, appear to “hang” in the night sky, almost as stationary as the stars. Comets reflect sunlight and fluoresce (glow). They are brightest near the Sun and sometimes visible in daylight. A typical comet, when far from the Sun, resembles a dirty, misshapen snowball, a few miles across. About 38% of its mass4 is frozen water—but this ice is extremely fluffy, with much empty space between ice particles. The rest is dust and various chemicals. As a comet approaches the Sun, a small fraction of the snowball (or nucleus) evaporates, forming a gas and dust cloud, called a coma, around the nucleus. The cloud and nucleus together are called the head. The head’s volume can be larger than a million Earths. Comet tails are sometimes more than an astronomical unit (AU) long (93,000,000 miles), the Earth-Sun distance. One tail was 3.4 AU long—enough to stretch around Earth 12,500 times.5 Solar wind and radiation propels comet tails away from the Sun, so comets traveling away from the Sun move tail-first. Figure 151: Nucleus of Halley’s Comet. When this most famous of all comets last swung by the Sun in 1986, five spacecraft approached it. From a distance of a few hundred miles, Giotto, a European Space Agency spacecraft, took six pictures of Halley’s black, 9 x 5 x 5 mile, potato-shaped nucleus. This first composite picture of a comet’s nucleus showed 12–15 jets venting gas at up to 30 tons per second. 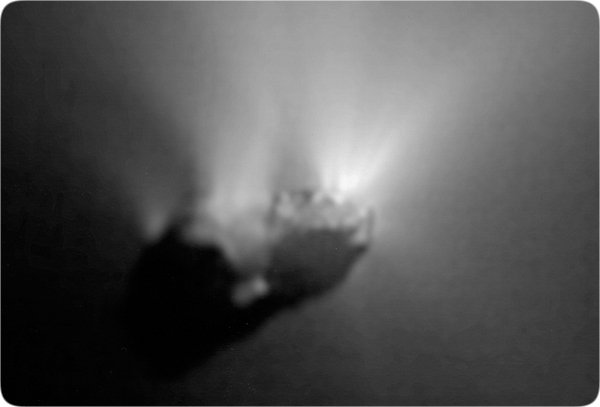 (Venting and tail formation occur only when a comet is near the Sun.) The gas moved away from the nucleus at almost a mile per second to become part of the comet’s head and tail. Seconds after these pictures were taken, Giotto slammed into the gas, destroying the spacecraft’s cameras. Comet tails are extremely tenuous—giant volumes of practically nothing. Stars are sometimes observed through comet heads and tails; comet shadows on Earth, even when expected, have never been seen. One hundred cubic miles of comet Halley’s tail contains much less matter than in a cubic inch of air we breathe—and is even less dense than the best laboratory vacuum. Later, thin traces of water were found at all lunar latitudes by three different spacecraft.7 Comets are a likely source, but this raises perplexing questions. Ice should evaporate from the Moon faster than comets currently deposit it, so why does so much ice remain?8 Also, recently deposited ice has apparently been discovered in permanently shadowed craters on Mercury,9 the closest planet to the Sun. Ice that near the Sun is even more difficult to explain. Figure 152: Cold Ice on Hottest Planet. Despite planet Mercury having an average surface temperature of 350°F, in 1994 radar on Earth received strong reflections from small regions near the south pole of Mercury indicating the presence of water ice about 10 feet thick. How strange! In 2011, the Messenger spacecraft, as it orbited Mercury, found that those small regions were crater floors (shown above in black) that never receive sunlight9 and have temperatures of about -235°F. This partially explains the anomaly. But how did that water get there—and from where? That ice could not have been on Mercury for millions of years. Meteoritic impacts would have scattered the ice into the Sun’s fiery glow or buried the ice with debris from those impacts. 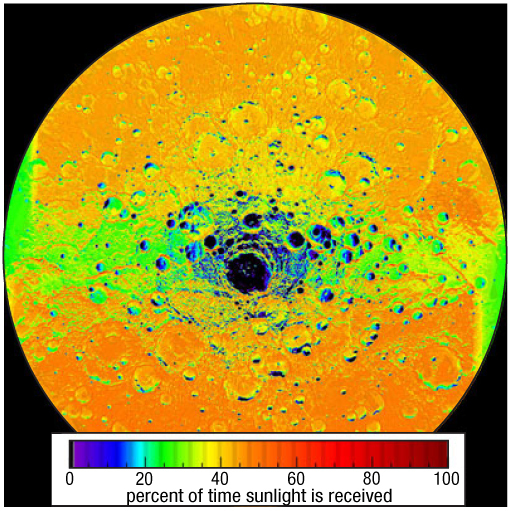 Nor could water have migrated into those craters from inside Mercury or on its surface without becoming hot water vapor (or disassociated, O, and OH) that would quickly escape into space. Where did the water come from? Comets, which contain a vast amount of water, are not hitting Mercury frequently today, but many comets may have delivered the water to Mercury in the relatively recent past. Obviously, Mercury’s water came from some place with considerable water. Could it have been Earth, “the water planet”? Fear of comets as omens of death existed in most ancient cultures.10 Indeed, comets were called “disasters,” which in Greek means “evil” (dis) “star” (aster). Why fear comets and not other more surprising celestial events, such as eclipses, supernovas, or meteor showers? When Halley’s comet appeared in 1910, some people worldwide panicked; a few even committed suicide. In Texas, police arrested men selling “comet-protection” pills. Rioters then freed the salesmen. Elsewhere, people quit jobs or locked themselves in their homes as the comet approached. b. Learn a few technical terms related to comets, their orbits, and their composition. c. Understand and test seven major theories for comet origins. If the impacts that produced these volcanic features occurred slowly from any or all directions, all sides would be equally hit. Only if the impacts occurred rapidly from a specific direction would large impact features be concentrated on one side of the Moon. Of course, large impacts would kick up millions of smaller rocks that would themselves create impacts or go into orbit around the Moon and later create other impacts—even on Earth. Today, both sides of the Moon are saturated with smaller craters. Were the large lunar impactors launched from Earth? Apparently. The Moon as a whole has relatively few volatile elements, such as nitrogen, hydrogen, and the noble gases. Surprisingly, lunar soil contains these elements—and water60—suggesting that they may have come from Earth. The relative abundances of isotopes of these elements in lunar soils correspond not to the solar wind but to what is found on Earth.61 If large impactors came from Earth recently, most moonquakes should be on the near side, and they should still be occurring. They are.